A composer whose name is not listed above is important to the genesis of the music on this richly enjoyable CD. Vincenzo Albrici was born in Rome in 1631, nephew of two composers, Fabio and Alessandro Costantini, son of a singer, Domenico Albrici. As a choirboy he sang and studied under Carissimi. Early in his twenties he took to the wandering life so common amongst Italian musicians of this period, working as a court musician and composer in Stockholm, Stuttgart, Dresden (where he stayed for some time) and elsewhere, In August of 1663 he was in London (along with his brother Bartolomeo. The Diary of Samuel Pepys contains more than one reference to Albrici and his music and Albrici seems to have been in London, in the service of Charles II, until April 1669. As Peter Holman points out in the booklet notes for this reissue of Hyperion CDA66817, Vincenzo Albrici was the composer of the earliest datable sonata for trumpet and strings, written during his years in Sweden, between 1652 and 1654; there’s a performance on another Helios issue – CDH55192 - Italian Baroque Trumpet Music. Whether or not Albrici was really the very first to write such music is neither knowable with any certainty nor perhaps terribly important; what is immediately important is that it seems to have been Albrici who introduced to the musical world of London the idea that trumpets might be employed as more than an instrument for military and ceremonial fanfares and that they might, indeed, play a full life in the growing repertoire of instrumental music. It is, in a sense, the fruit of Albrici’s influence that we hear on this present CD, in works written by composers based in London, notably Purcell as well as some of his contemporaries and successors. Purcell’s three contributions consist of the fairly basic Symphony from The Yorkshire Feast Song; the more elaborate Symphony from The Indian Queen, which is an adaptation of materials from the Ode ‘Come, ye sons of art, away’, plus a new final movement, in which the writing is subtle and the playing is both spirited and precise; and, of particular beauty, the Symphony from the final act of King Arthur, music which accompanies Britannia’s appearance, rising on an island from beneath the stage. Gottfried Finger seems doomed to an unfortunate fame as the man who came last in the 1701 competition to set Congreve’s masque The Judgement of Paris, beaten by John Weldon, John Eccles and Daniel Purcell and who supposedly left England in a huff. In fact his three sonatas are entertaining and often witty. The first of the three, for trumpet, oboe, violin and continuo is particularly fine, elegant and inventive. The second, for trumpet, violin and continuo and the third, for trumpet, oboe and continuo, are also never less than interesting, quite subtle in their interplay of voices. The same British Library manuscript (Add. MS 49599) which contains Finger’s sonatas also includes work by James Paisible and John Barrett. Paisible, who was born in France, worked in London from 1674, as an oboist, player of the recorder and of the bass violin, as well as being a composer. His sonata, for two trumpets, harpsichord and strings, is in three movements, two allegros framing an adagio; the sonata by John Barratt, for a trumpet, oboe, harpsichord and strings, follows a similar pattern (allegro-largo-allegro). In both one hears anticipations of later concerto structures. Three native English composers – John Eccles, William Croft and William Corbett – are also represented in this well planned anthology. Both the Suite by Eccles and Croft’s Overture were written for specific ceremonial occasions. The composition by Eccles, written for Queen Anne’s coronation in 1702, was published (in Harmonia Anglicana of 1702) minus the trumpet part it obviously needs, and for this recording that part has been supplied by Richard Platt and Peter Holman. It is a convincing piece of musical restoration. Croft’s impressive Overture, in four movements for trumpet and strings, dignified without overstatement, prefaced an ode which Croft wrote for performance in Wren’s Sheldonian Theatre in Oxford when he was awarded his D.Mus. in July 1713. William Corbett’s assured suite, in nine short movements is scored for two trumpets, two oboes, bassoon, harpsichord and strings, was surely written for some specific ceremonial occasion, or possibly for a grand theatrical event, though we don’t know now what the occasion might have been. 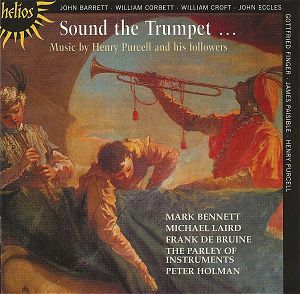 The music is attractively various, achieving that winning fusion of continental and English idioms which Purcell had pioneered, drawing on the work of European musicians such as Albrici and Matteis (see Peter Downey’s ‘What Samuel Pepys Heard on 3 February 1661: English Trumpet Style under the Later Stuart Monarchs’ in Early Music , 18, No. 3, August 1990). Throughout the recording the playing of the soloists is exemplary, as is the accompaniment directed from the keyboard by Peter Holman. This is a thoroughly enjoyable – and historically valuable – sampler of early English trumpet music.